BNWT Girls jumper from M&S. Cut out/cold shoulder detail. Age 4 - 5 years. Great condition, lots of girl's clothes listed. M&S Yellow Girls Cardigan 3-4 Years. Condition is Used. Dispatched with Royal Mail 2nd Class. Happy to combine postage for multiple items, bundles up to 2kg £3.00 Royal Mail 2nd Class small parcel. Stripey cardigan for age 2-3 years. BNWOT M&S Toddler Girl Sweatshirt/Jumper 2-3 Years. Unworn. Beautiful Swan Design. 3D feathers. Spearmint light green. Lovely and soft. Back of jumper has Velcro fastening from top to bottom. Only selling because my daughter doesn’t like it. This is £10 on their website - can be checked. Dispatched with Royal Mail 2nd Class. Really lovely M&S girls pale Yellow/Lemon cardigan age 2-3. Perfect summer colour. 100% cotton, great condition. Dispatched with Royal Mail 2nd Class. M&S MICKEY MOUSE JUMPER AGE 9-10 YEARS. M&S Girls Cashmere Cardigan, Age 7-8 with poppers, beautiful stitching. Good used condition. Girls lilac chenile cardigan with frilly edging. Age 2-3 By Marks & Spencer . Condition is barely used - looks new. From smoke and pet free home. Marks And Spencer M&S Girls Cardigan Blue 2-3 Years. Dispatched with Royal Mail. Marks And Spencer Baby Unisex Cream Lined Cardigan Age 2-3 Years. Condition is Used. Dispatched with Royal Mail Signed For® 2nd Class. BRAND NEW WITH TAG. Mint colour girls cardigan. RRP £12. From Marks and Spencer. Age 3-4 Years. Height 104cms Chest 56cms. Please take a look at my other items. I will combine postage where possible. Marks And Spencer Girls Hoodie Age 4-5yrs. Knitted navy zip fastening hoodie with sparkle weave. Pom Pom on the end of the hood and fleecy lining. Condition is Used. Dispatched with Royal Mail 2nd Class. Girls Red Jumper Age 10-11 years from M&S. excellent quality, got to wear on Xmas jumper day but it was warm so ended up just wearing a red T-shirt, it won’t fit next year so selling Pet free/smoke free home Dispatched with Royal Mail 2nd Class. Girls Age 9-10 Years M&S Navy Blue Cardigan. Condition is Used. All buttons in tact, does have a name that has washed out on the tag as shown in the pictures. In good condition. Marks and Spencer's. 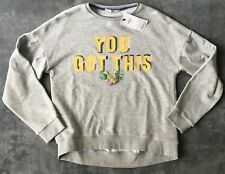 BNWOT M&S Marks Toddler Girls Sweatshirt/Jumper 2-3 Years. Beautiful Swan Design. Condition is Used. Dispatched with Royal Mail 2nd Class. M & S Girls Blue Stripe Open Cardigan. Age 9 - 10. Open waterfall Cardigan. In very good condition. Happy to answer any questions. Returns not accepted. Girls 3-4 Cardigans M&S. Blue Chunky Hooded. Spring Clothes. Girls 3-4 Cardigans M&S. Blue Chunky Hooded. Spring Clothes.. Condition is Used. Dispatched with Royal Mail 2nd Class. Two lovely cardigans but showing signs of wear. The Autograph one has some bobbling- sorry my ‘fuzz away’ to de-bobble is bust, otherwise I’d clear it up for you. marks and spencer girls pink cardigan age 18-24 months. Condition is Used. Dispatched with Royal Mail 2nd Class. girls cardigans 2-3. M&S one royal blue cardigan with diamond pattern and one pink cardigan with heart pattern. Condition is Used. Dispatched with Royal Mail 2nd Class. AN ATTRACTIVE LONG SLEEVE MARKS & SPENCER SWEATER/JUMPER, WITH CUT OUT STYLE SLEEVE DESIGN. GIRLS SIZE AGE 10-11 YEARS ATTRACTIVE NEXT JUMPER/SWEATER. THE TOP HAS BEEN WORN SPARINGLY AND REMAINS IN SUPERB UNMARKED CONDITION. Chunky knit cardigan with embroidered flowers for age 3-4 years. Girls New Marks And Spencer Red Cardigan Age 5-6. Condition is New with tags. Dispatched with Royal Mail 2nd Class. M&S Girls Navy Cardigan Age 5-6. Condition may be used but I can’t remember when. Immaculate. See my other girls dresses and shoes for summer Dispatched with Royal Mail 2nd Class. Gorgeous Marks and Spencer girls jumper age 7-8 years in burgundy / berry, featuring a raccoon on the front and back with diamante nose. Condition is Used but excellent. Dispatched with Royal Mail 2nd Class. Machine washable from a smoke free home. M&S Cardigan Pink Waffle Knit 3-4 Years. Great condition. Girls Grey Marks And Spencer Jumper. Aged 12 To 13, With Tags attached. lovely long sleeve with bright design. also with marks and Spencer pink joggers aged 12 to 13,used but bright and clean. Dispatched with Royal Mail 2nd Class. Thanks for looking. This jersey waterfall cardigan is in a very good condition. It has an applique hear on the front. Marks And Spencer Girls Chenile Navy Cut Out Shoulder Jumper Aged 9-10. Dispatched with Royal Mail 2nd Class. BNWT Girls Coral M&S Cotton Frill Sleeve Cardigan Age 12-13 Years. Brand new girls Mark's and Spencer coral Cardigan. 100% cotton. Age 12-13 years Measurements on the label Chest 83cm. 32.5in Height 158cm. 62in Lovely and soft cotton material and excellent quality as you would expect from Mark's and Spencer. Original price of £14 shown on the label. girls jumper age 12-13. From marks. Never been worn. Blue with a sequin motif of flamingo. Marks and Spencer girls jumper - 13-14 years. Girls grey jumper from. M&S with sequin pineapple design on front (not the sequins that flip). Age 13-14 years. *NEW & TAGS* GIRLS MARKS & SPENCER YELLOW RUFFLE SLEEVE CARDIGAN AGE 2-3 YEARS. Dispatched with eBay delivery – Shutl 2-3 days. Marks And Spencers 2-3 Year Pink Knitted Bear Cardigan. Condition is Used. Dispatched with Royal Mail 2nd Class.